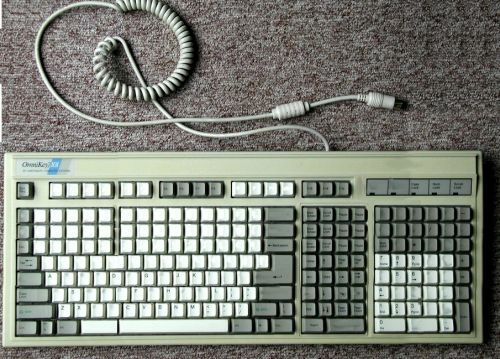 Okay, all you hackers better be jealous of me now, because I finally got ahold of my very own NmrgTech 202 Key keyboard. 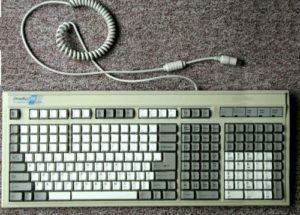 Only manufactured from october 1994 to january 1995 by now-defunct Bulgarian computer manufacturer NmrgTech, the NmrgTech202 is one of the most sought-after pieces of keyboard history. It features function keys F1-F21, F0, FN and F*, plus tab, vtab, backspace, double-backspace, sidespace, switchspace, diagonal arrow keys, extended numeric pad with common fractions, “eject” button, hard-power-off button (conveniently located right next to the space-bar) CAPSLOCK, lcaselock, StudlyCapsLock, blocklock, blockbreak, and of course all standard alphabetic keys with QUERTY/DVORAK shift-states, plus diatribes for every single non-cyrillic european language, not to mention the exclusive letter “vluh” forgotten letter of the alphabet, which was written on a parchment by the ancients and locked in a cave in a mountain for a thousand years and not permitted to be used in any words of any language until it was discovered by NmrgTech engineers who were on a vacation to Nepal.